You may wish to read an introduction to this section and page one first. The construction of Basilica della Santa Casa began in the late XVth century and by 1530 the building was completed. 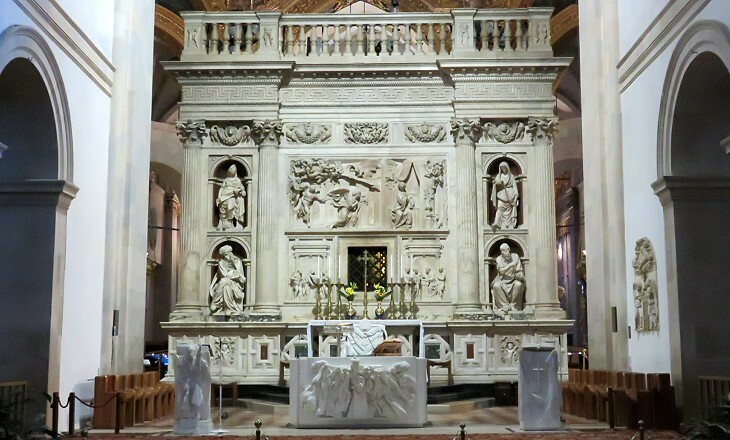 As often occurred in Italian churches it did not have a proper façade. 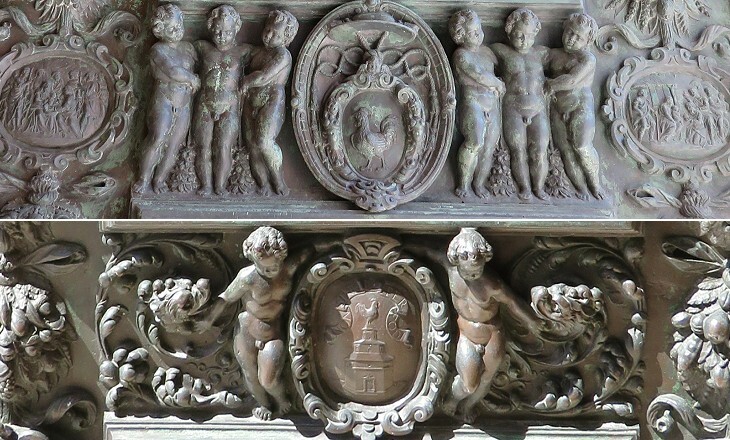 The lower part was finished in 1583; an inscription making reference to Pope Gregory XIII and Cardinal Filippo Guastavillani, Protector of the Holy House, celebrated the achievement. 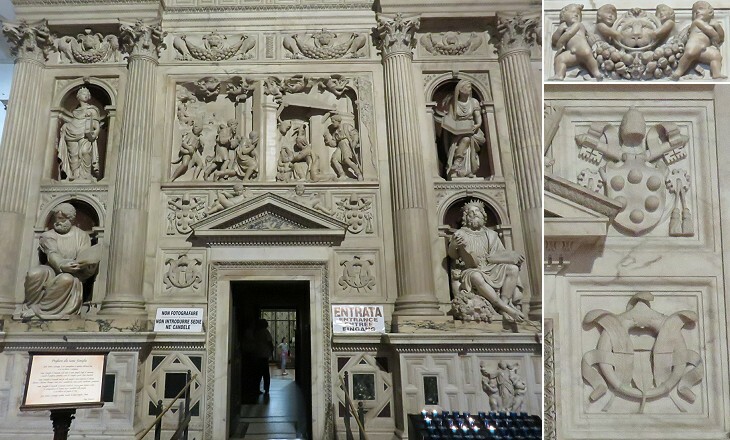 The façade was completed in 1587 as stated in two other inscriptions making reference to Pope Sixtus V and Cardinal Antonio Maria Galli, Bishop of Osimo. When the construction of the Basilica was still in its very early stages some parts of it were already fully decorated. 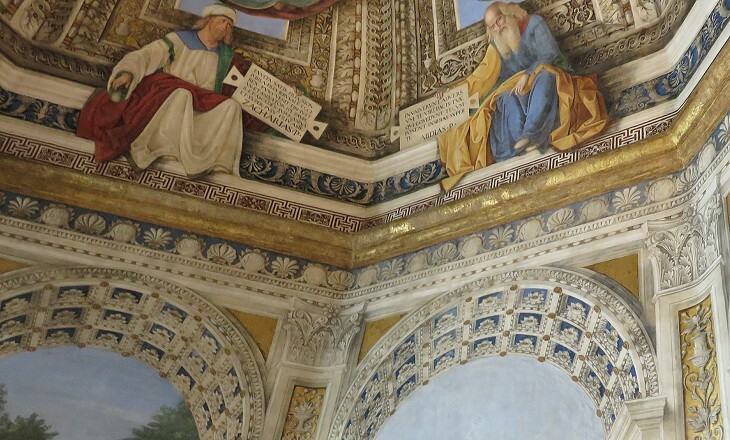 Two octagonal rooms were decorated by Melozzo da Forlì and Luca Signorelli, two leading painters of the time, at the request of Cardinal Girolamo Basso Della Rovere, Bishop of Recanati and nephew of Pope Sixtus IV. They are now used as sacristies. Geometrical perspective fascinated Early Renaissance artists, especially in Florence. Leon Battista Alberti wrote in 1435 a treatise on proper methods of showing distance in painting. 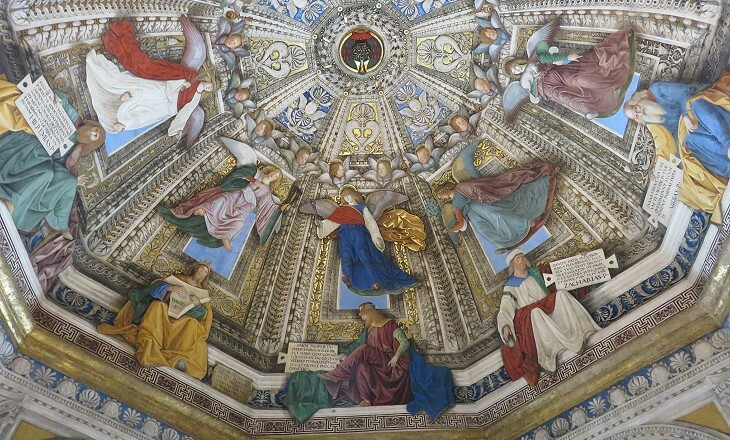 They applied to the representation of human beings and of buildings and Melozzo showed his skill in this respect by depicting angels floating in the air and fake arches. In the XVIIth century the study of perspective laws led to painting some amazing illusionistic ceilings in Rome and elsewhere in Europe. 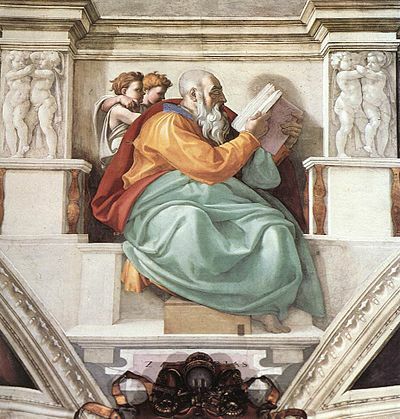 Signorelli did not pay attention to perspective effects as much as Melozzo because his angels are portrayed in a rather static pose and remain well inside the frames which surround them. 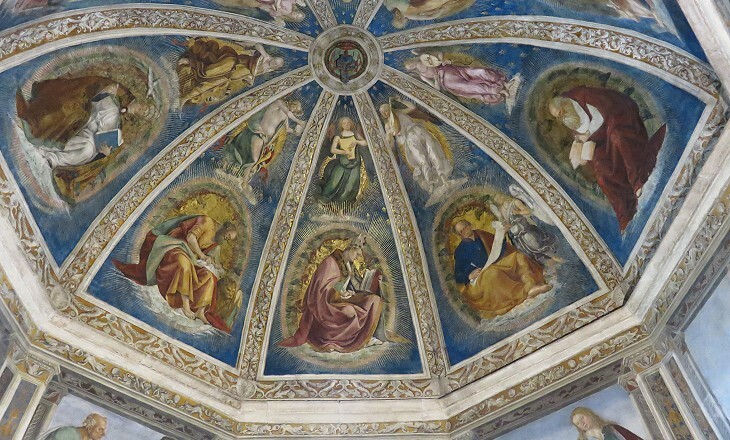 The massive figures of the Evangelists/Doctors of the Church painted by Signorelli under the angels anticipate Michelangelo's Prophets/Sibyls in the Sistine Chapel ceiling (see Prophet Zachary - it opens in another window). 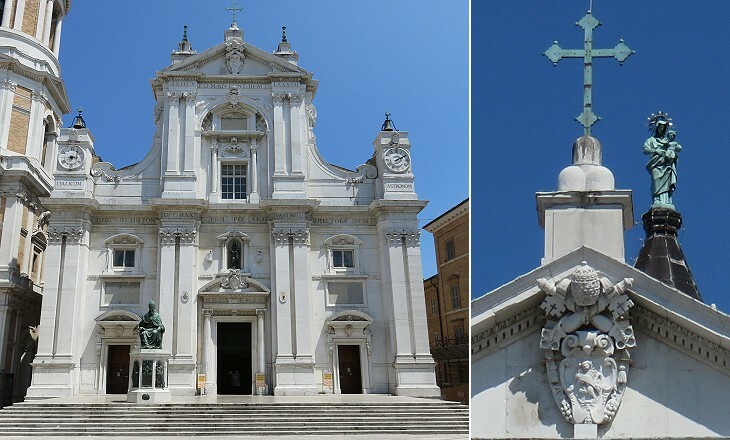 This edifice designed by Bramante and executed by Sansovino early in the sixteenth century, the golden age of modern art, appeared to us so remarkably elegant as well as rich and the statues and alto rilievos so finely executed we could not sufficiently admire it. (..) The same style is not suitable to a shrine and a citadel and if a profusion of decoration be proper any where it is surely in this building. The architect has taken advantage of the singular felicity of its situation under cover to indulge a luxuriance and refined elegance of taste and execution which can so rarely be used in the external part of any building. James Edward Smith - A Sketch of a Tour on the Continent: in the Years 1786 and 1787. J. E. Smith (1759-1828) was an English botanist and the founder of the Linnean Society. In his Grand Tour of Europe he included a journey to Loreto, something very few English travellers of the past did, as the sanctuary was regarded as a despicable example of Catholic Mariolatry (the idolatrous worship of the Virgin Mary). The house of our lady of Loretto is fabled to have been carried from this grotto which the Padre (Father, the prior of the monastery) assured me it exactly fitted before it was enlarged. The casing does not allow the view of the Holy House from the outside so it is difficult to judge whether it fits the empty space in the Church of the Annunciation at Nazareth. 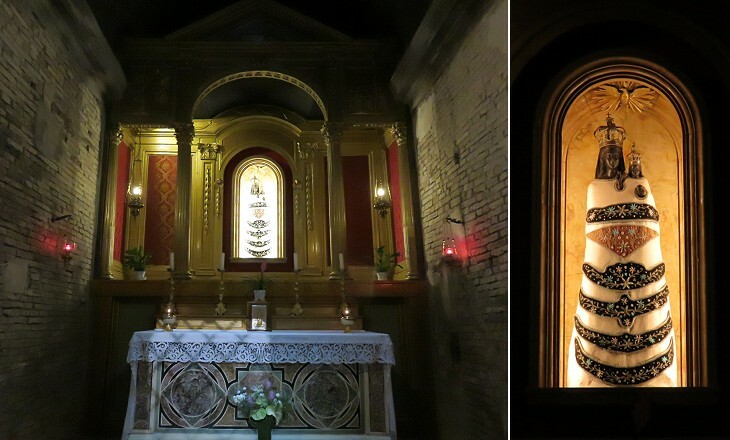 Taking photographs inside the Holy House is not allowed, but the prohibition does not apply to a small replica (it opens in another window) which the inhabitants of Recanati built in their town. It contains some bricks of the Holy House and a copy of the famous statue of Our Lady of Loreto. The original wooden XIVth century statue burnt in a fire which occurred inside the Holy House in 1921. 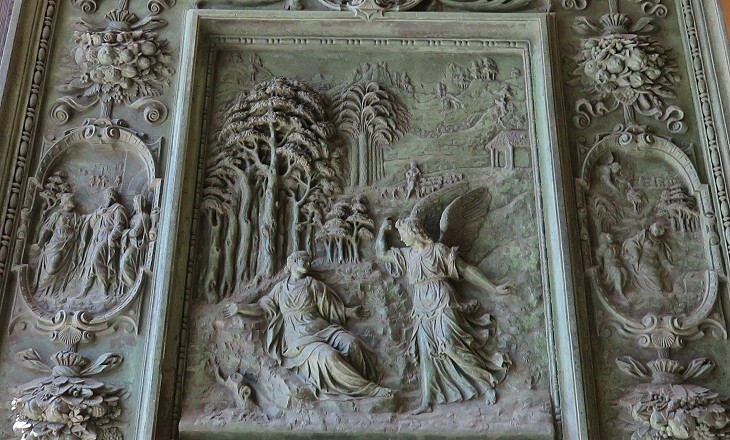 The reliefs (see The Miracle of the Holy House in page one) and the statues were placed some years after the completion of the casing structure. They have a clear religious content, but the rich decoration which frames them is an outcome of the Renaissance passion for the Ancient World and its ornamental patterns. The marble casing is a unique building, but it recalls Ara Pacis Augustae in size, shape and decoration, although this monument was not yet known in that period. 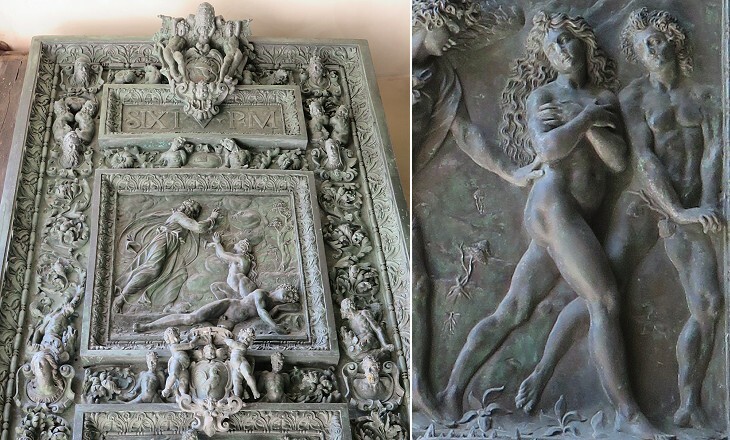 The events to be depicted on the three bronze doors were decided by Pope Sixtus V although the doors were completed many years after his death. Strangely enough only some side small elliptical panels portray events of Virgin Mary's life. The focus of the decoration is on the Old Testament and it includes episodes which the ordinary Loreto pilgrims were not familiar with (the introductory page shows a relief portraying Judith killing Holophernes). 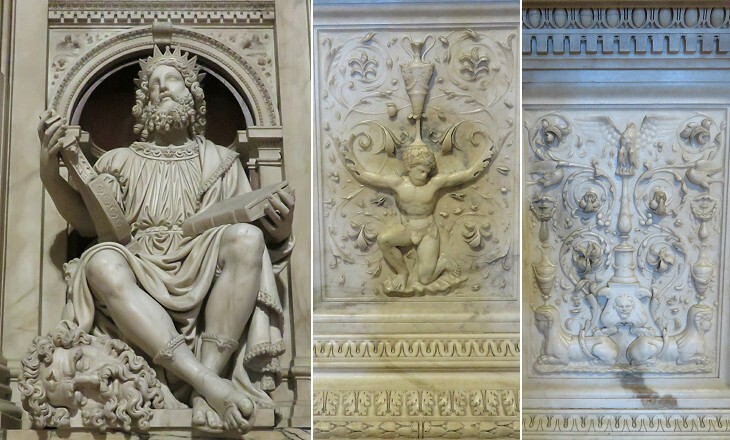 Pope Sixtus V had the grand fountain he built in Rome decorated with a statue of Moses and reliefs showing episodes from the Old Testament, yet in 1590 he confirmed a bull issued by Pope Pius IV in 1564 which forbade Catholics from reading the Bible in modern languages and established sanctions for typographers who printed such versions. This approach was officially changed in 1965 by Dei Verbum (Word of God), a document of the Second Vatican Council which was endorsed by Pope Paul VI. The comment made on the marble casing applies to the bronze doors too. 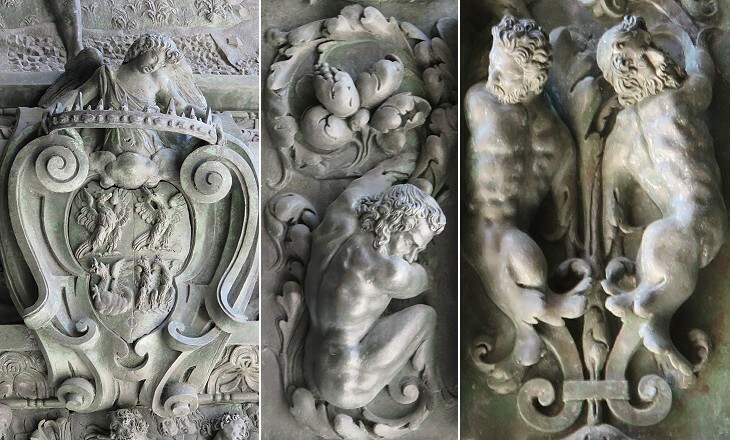 The rich decoration moves away from the religious themes and the group of sculptors who worked at the doors showed all their skill in depicting naked men and children, dragons, fruits, leaves and quite obviously the coats of arms of their patrons.